The following Rules and Regulations are for the protection, safety, and benefit of all our members. Your full cooperation is imperative and will enable use of our facilities to be safer, more sanitary, and pleasant for all. Parents, please caution your children to observe all Rules and Regulations, all posted signs, and instructions from guards and other pool staff. Non-compliance may result in temporary expulsion from the pool. 1. No running, pushing, wrestling, ducking of other swimmers, spitting or spouting of water, distraction of guards, foul language, rough play, or any other disorderly, dangerous or unhygienic conduct is permitted. 2. 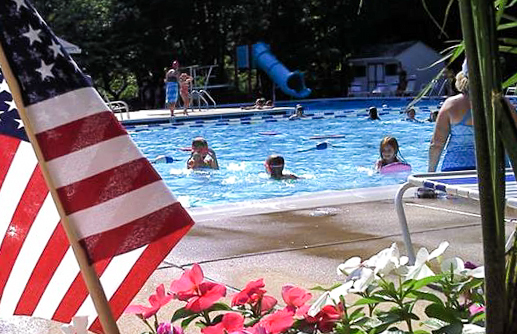 Persons with diarrhea, open cuts or lesions, colds, or other diseases that can be communicated via water may not enter the pool, except in cases where a medical doctor certifies that their use of the pool does not create a hazard for other patrons. 3. A. Children under 10 years of age must be accompanied on the pool property by a responsible person at least 14 years of age. 3. B. Children who are not toilet trained must wear BOTH swim diapers and tight-fitting plastic pants when swimming. 4. Persons of any age who are not water-safe must be attended by a competent swimmer while in the pool. 5. Guards may require a test of swimming proficiency of any person before that person is allowed to swim alone in areas where they cannot stand. 6. Only one person may be on the diving board at a time (including the steps). Diving and jumping is permitted only straight forward from the boards, springing only once, except when the diver is supervised by an authorized Seven Locks diving coach. After diving from the board, the diver must swim to the nearest ladder. No swimming is permitted in the diving well when the diving boards are in use. Diving board users must be able to swim to the ladder unassisted. No cartwheels or handstands are permitted off the board or the side of the pool. Goggles, masks, and flotation devices are not permitted when diving. 7. Swimmers must wear proper attire and take a shower before entering the pool. 8. The baby pool is restricted to use by children under 6 years of age. There is no guard stationed at the baby pool area. Parents, or those responsible for children in the baby pool, must stay within the fenced-in area of the baby pool and supervise children at all times. If parents or those responsible leave the baby pool area, their children must be taken with them. Children in diapers must wear tight-fitting plastic pants. Food and drink are prohibited in the baby pool area. 9. A two-lane area may be reserved for lap swimming. 10. Play equipment that interferes with other swimmers, hard balls, and any other play items that may create a hazard or cause injury are not allowed in the main or baby pools. Guards may restrict the use of any item of play equipment in their discretion, particularly during peak use periods. 12. Chewing gum and smoking are absolutely prohibited in the pool complex. 13. Radios are to be played only with earphones or headphones. 14. Pets are not allowed on the grounds. 15. All costs resulting from property damage will be charged to the responsible individuals. 16. Food, drink, glass items, and other objects that may create a safety hazard are not allowed in the pool or on the concrete pool deck area. 17. Children may not play in the drainage well or on any hill slopes adjacent to the tennis courts or parking lot. 18. No person shall give, furnish, or make available for consumption any alcoholic beverage to any person under the age of 21 years on the premises of Seven Locks Pool, Inc. Any person who is not a member of Seven Locks Pool, Inc., and who violates this prohibition, shall be required to leave the premises forthwith; and such person shall not be allowed to return to the premises without the express consent of the Board of Directors. 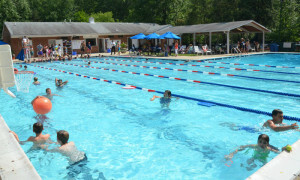 Any person who is a member of Seven Locks Pool, Inc., and who violates this prohibition or whose guest violates this prohibition, may have all rights and privileges of membership suspended for up to 14 days for a first offense, for up to 30 days for a second offense, and permanently for a third offense. The length of such suspension shall be at the discretion of the Board of Directors. Any such suspension shall be measured in consecutive days of the summer swimming season, and it shall continue into the following swimming season if it is not completed during the season of its imposition. Any person who is younger than 21 years of age and who consumes any alcoholic beverage on the premises of Seven Locks Pool, Inc., may be required to leave such premises forthwith. 19. Except with the express permission of the Pool Manager, the President, or the Vice President for Management, no pool member may hold a private function on the pool premises that includes more than 10 persons. As used in this rule, the term “private function” means any function that is not sponsored by the pool. It includes any gathering for social, athletic, or other purposes. 20. Guards have the authority to issue instructions, enforce rules, and restrict any patron’s use of the facility. 21. The Pool Manager or Assistant Manager shall have the authority to expel from the Seven Locks Pool property and to deny the recreational privileges of that property to any adult or minor member for violation of these Rules and Regulations. Any such expulsion and denial shall not exceed forty-eight (48) hours. This rule shall not limit the application of Rule 18 relating to alcohol and minors.